Well, it’s turning out to be one of the biggest “who knew” questions of the year when it comes to comedian Byron Allen. Bet you didn’t know that besides making people laugh for years, he’s also an entrepreneur, media mogul and the CEO of his own company, Entertainment Studios, Inc. Founded by Allen in 1993, Entertainment Studios is a global media production and distribution company with 8 HD networks, dozens of syndicated shows, over 5,000 hours of HD programming, a film distribution company, a podcast network, and more to come. But, that’s not the big news, this is—Allen recently acquired the Weather Channel for around $300 million, making it a now Black-owned company. “The Weather Channel is one of the most trusted and extremely important cable networks, with information vitally important to the safety and protection of our lives,” said Allen. In the early 1970s, Weather Central develops the first on-air weather system using computer graphics with WSI being founded on December 29, 1978 (WSI). In the early 1980s, there is expansion into aviation weather systems and WSI is the first to provide aviation weather briefings via dial-up, called Pilotbrief. The Weather Channel debuts on May 2, 1982 becoming the first 24-hour weather programming and first national TV network able to automatically customize content based on viewer location. For over three decades, The Weather Channel has provided national and local weather forecast for cities, as well as weather radar, report and hurricane coverage. Allen moved from Detroit to Los Angeles, when his mother took an internship at NBC. The exposure to television shows such as “The Tonight Show”, “Sanford and Son” and more encouraged his interest in entertainment. At the age of 14, Allen began performing standup comedy at amateur clubs which led to chance meetings with likes of comedian Jimmie Walker, David Letterman and Jay Leno. He would go on to appear on “The Tonight Show” becoming the youngest person to do so and made appearances on “Dinah”, “Hollywood Squares”, and the “Merv Griffin Show”. NBC would offer Allen the job of co-host on “Real People”, and early reality TV show. While working on “Real People”, he learned television production and started thinking up his own television shows. In 1992, Allen got multiple breaks hosting “Kickin’ It With Byron Allen”, “Entertainers with Byron Allen”, “The Byron Allen Show” and “Comics Unleashed”. “Entertainers with Byron Allen”, was a weekly series profiling film and television stars that ran for 32 series, setting the record for the largest independent producer of first-run syndicated programming for broadcast television globally. 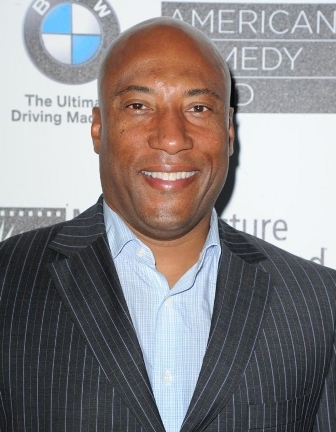 The Byron Allen Show premiered on 155 television stations. Now with his media production, Allen is set to make even more strides in the network industry. “We welcome The Weather Channel, which has been seen in American households for nearly four decades, to our cable television networks division. The acquisition of The Weather Channel is strategic, as we begin our process of investing billions of dollars over the next five years to acquire some of the best media assets around the world,” said Allen.